On this page you will find information about RLS’s travels to Fife and Lothian including Anstruther, RLS’s canoe trips along the Firth of Forth, Leven, North Berwick and St Andrews. (RLS, “The Education of an Engineer: More Random Memories” in Across the Plains with Other Memories and Essays [London: Chatto and Windus, 1892], pp. 189-90). In 1867, RLS began his studies at Edinburgh University in the family business – lighthouse engineering. In the summer of 1868 he visited the harbour works at Anstruther and Wick to learn more about the practical side of the job. He wrote about these experiences in “The Education of an Engineer” (1888), later included in Across the Plains (1892), stating: “What I gleaned [about lighthouse engineering], I am sure I do not know; but indeed I had already my own private determination to be an author” (“The Education of an Engineer”, Across the Plains, [London: Chatto and Windus, 1892], p. 189). Indeed, at Anstruther, Stevenson was preoccupied by his writing. From 1 – 31 July 1868 RLS lodged with a man called Bailie Brown at Cunzie House on Crail Road. You can see the house in these images, as well as the plaque that commemorates RLS’s stay there. While at Anstruther, RLS also visited Pittenweem (probably on 19 July 1868), a nearby village. He went to Pittenweem Church, where he was impressed by the unique architecture. RLS visited Lochcote House (home of Charle’s Baxter’s family), near Bathgate in c. 25-27 July of 1879. He spent the weekend there with Baxter, and the two lunched at the Royal Hotel in Bathgate. (RLS, “The Canoe Speaks”, Underwoods, The Works of Robert Louis Stevenson, Swanston edn, vol xiv [London: Chatto and Windus, 1911], p. 69). According to Eve Blantyre Simpson in The Robert Louis Stevenson Originals (1912), her brother, Walter Grindlay Simpson and RLS would often go canoeing on the Firth of Forth. Walter Simpson (or “the Bart.” as he is referred to in the text) and his brothers kept their canoes at Granton, where they would boat and swim. According to Eve Simpson: “R.L.S. had taken passage on a double canoe with the Bart. They coasted up to the Hawes Inn, Queensferry” (The Robert Louis Stevenson Originals (New York: Charles Scribner’s and Sons, 1912), p. 83). Simpson’s work gives an interesting account of RLS’s friendships with Walter Simpson, Charles Baxter and Bob Stevenson. Her chapter “Comrades and Canoes” talks about RLS’s love of being on the water. RLS planned a canoe trip along the Firth on 19 April 1879, but was forced to cancel due to poor weather: “Canoeing quashed by return of winter armed at all points” (Letter from RLS to Bob Stevenson, April 1879, from The Letters of Robert Louis Stevenson, ed. by Bradford A. Booth and Ernest Mehew, vol ii [New Haven: Yale University Press, 1995], p.318). (From RLS to his mother, written from Leven on 26 July 1868, from The Letters of Robert Louis Stevenson, ed. by Bradford A. Booth and Ernest Mehew, vol i [New Haven: Yale University Press, 1995], p. 135). While staying in Anstruther in July 1868 as part of his “education of an engineer”, RLS visited Leven. 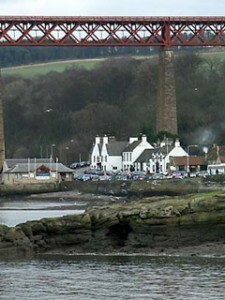 A seaside town in Fife, Leven was also the home of Dr John Balfour, Stevenson’s maternal uncle. RLS’s letters show that he stayed in Leven on 19 and 26 July. RLS also visited the mansion Newton Hall in the village of Kennoway (near to Leven), probably on 25 July 1868. (RLS, “The Lantern Bearers”, Across the Plains with Other Memories and Essays [London: Chatto and Windus, 1892], pp. 206-07). When RLS was a child, the Stevenson family often summered in North Berwick, Scotland. At the time, the small fishing village overlooking the Firth of Forth was a holiday resort. The Stevensons visited it, as well as Bridge of Allan and Peebles in the summer, for both Stevenson’s own health and his mother’s. Stevenson had holidays here, first staying with his uncle David in 1860, and then in the autumn of 1865, July of 1866 and September of 1870, staying with his parents at ‘Rockend’ on the east bay (the letters suggest that he also came in the autumn of 1867). Here he would meet up with holidaying boys of his own age and his slightly older cousin Bob. You can read more about RLS’s memories of North Berwick in his essay “The Lantern Bearers” (1888), later included in Across the Plains (1892). 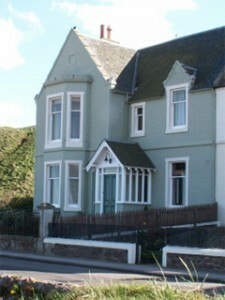 Visitors to North Berwick can see the house where RLS stayed and explore the landscape which was the setting for “The Pavilion on the Links” (1880) and part of Catriona (1893). In Catriona, David was imprisoned on the Bass Rock, an island off of North Berwick. David Stevenson, RLS’s cousin, built the lighthouse that stands on the island in 1902. (Catriona, The Works of Robert Louis Stevenson, Swanston edn, vol xi [London: Chatto and Windus, 1911]). The Fidra Lighthouse was built in 1885, and was designed by RLS’s cousin David Stevenson. In “The Lantern Bearers”, RLS describes how he climbed the Berwick Law. The residents of North Berwick still celebrate RLS’s time in the village. 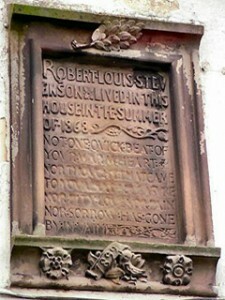 In 9-19th June 2006, they held the Robert Louis Stevenson Festival, North Berwick. The festival included Stevenson workshops, a musical and even a treasure hunt. (RLS, “Random Memories – Contributions to the History of Fife”, in Across the Plains: with Other Memories and Essays [London: Chatto and Windus, 1892], p. 174). You can read about Stevenson’s memories of St Andrews in “Random Memories – Contributions to the History of Fife” (1888), later included in Across the Plains (1892). RLS travelled to St Andrews with his father in 1863 to oversee the harbour lights there.